Japan has published the Household Spending y/y and 10-y Bond Auction and the US will release 10-y Bond Auction, JOLTS Job Openings, and NFIB Small Business Index. 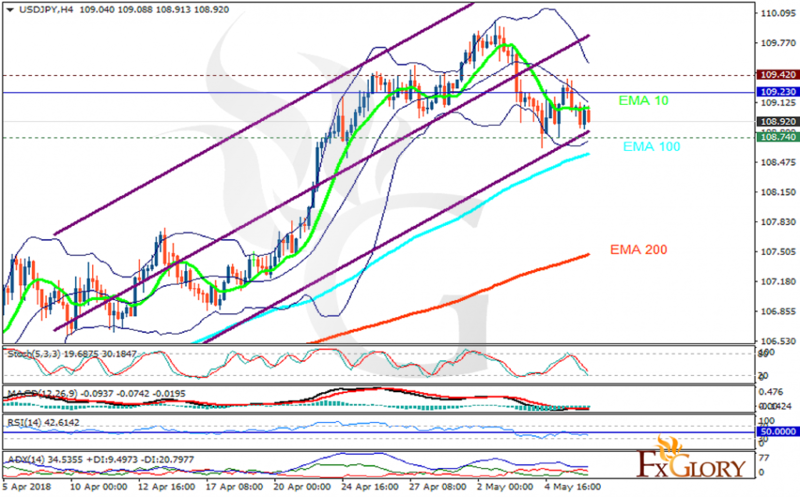 The support rests at 108.740 with resistance at 109.420 which the weekly pivot point at 109.230 is located in between the lines. The EMA of 10 is moving horizontally in the ascendant channel and it is above the EMA of 200 and the EMA of 100. The RSI is falling towards the oversold area, the Stochastic is showing downward momentum and the MACD line is below the signal line in the negative territory. The ADX is showing weak sell signal. The pair may drop towards the lower Bollinger band but it will grow towards 110 eventually.